The "Line 700" line was originally called Martelé Line 700. This design debuted as part of the 1926 Martelé line. 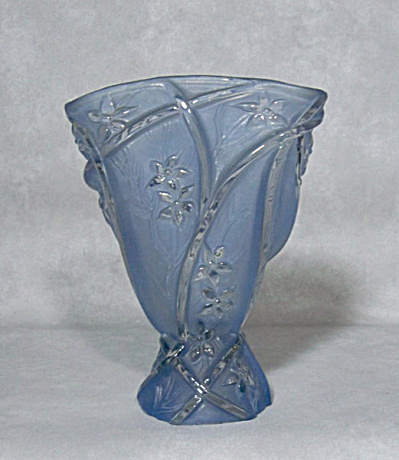 The design of vines and flowers was without a doubt inspired by Lalique's Sauterelle (Grasshopper) vase. The design minus the grasshoppers is on two vases in the original 1926 Martelé line: a 7" vase and a 10" vase. Consolidated expanded the design into its own line and introduced it to the glass trade in January 1929. If was offered in "jade, powder blue, honey, and crystal in a full line of flatware, bowls, and vases of various sizes." (Wilson page 60). According to Wilson, certain finishes on the 7" and 10" vases are hard to find including satin black, bright ruby red, matte red, and finishes on a custard glass base. Only the vases were made in these colors. Here you have the #712 10 ounce goblet which has been turned into a "fan" vase by stretching the top rim while it was hot. The fan vase is shown in the original catalogue (page 126 Wilson) as #702, standing 6 1/2 inches tall. It is in excellent condition. Add it to your Art Deco glass or Consolidated glass collection today.